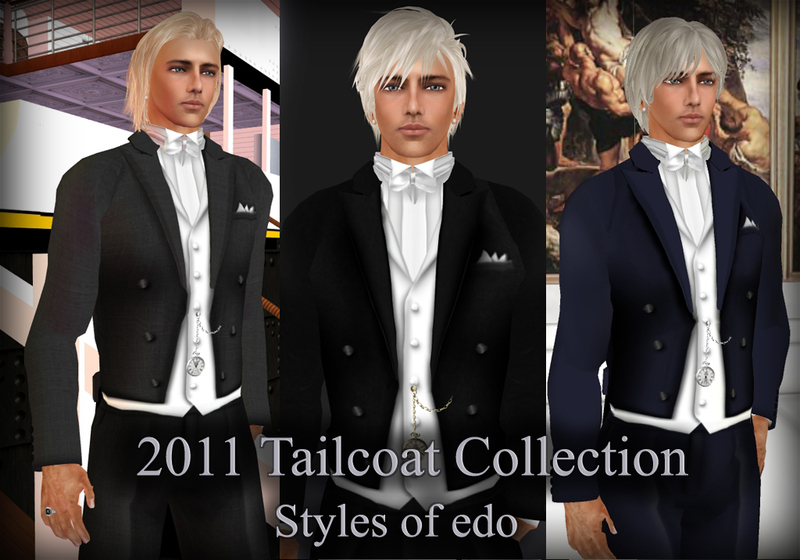 Posted in: Event, Information, Men's clothing, Men's shoes, Second Life Fashion, tuxedo. Many of you already know that I will leave SL in April by my Note card that I sent to my staffs. are failed SL business. Yes, it is Very hard world. It cannot be survive in SL business if designer only makes high quality items nor play while he makes products. I had worked every day in SL and RL for five years. SL business gave me could buy my own property in RL therefore it made me very exhaust my mental and physical. I had been illness for a long time since last year and I became difficult enjoy SL business anymore. That is why I decide to leave SL then enjoy my RL. till they do not need my support. I believe that was my mission and goal. Lately, I found new talented creator. One of them is Dura hair shop. They are Hair designers. They are future designers who has a new sensation. They will be a big success if they learn how to run business and product marketing. My think my last mission is I recommended Dura to you. I looked back my SL..It’s very difficult to have good communications and often became a target of abuse in this Cyber world. Fortunately, I had met wonderful people in my SL. I had learned many things from them and they gave me a dream and blow my mind away. they inspired me and my SL world was broadened by their passion. However, I have my RL world that is waiting for me. I graduate from edo Tone then I believe I will follow my New dream in RL. Thank you every one from bottom of my heart. Posted in: Event, Men's clothing, Men's shoes, tuxedo. Tagged: sale mens men's suit tuxedo. 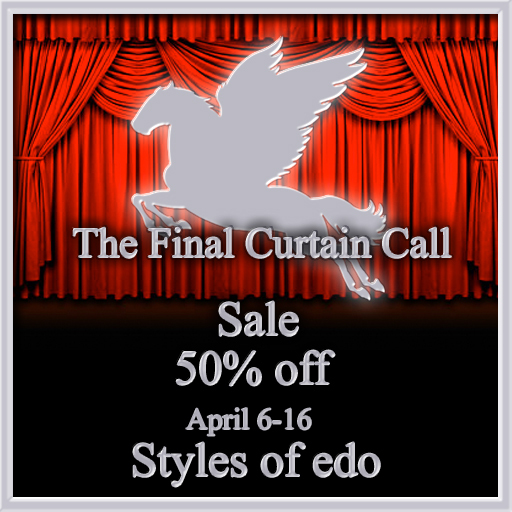 Tableau Vivant came to Styles of edo! We have their skins in our main shop. You know Tableau Vivant is good skin brand. And I will use skin of Tableau Vivant this year. Posted in: Event, Information, Men's clothing. 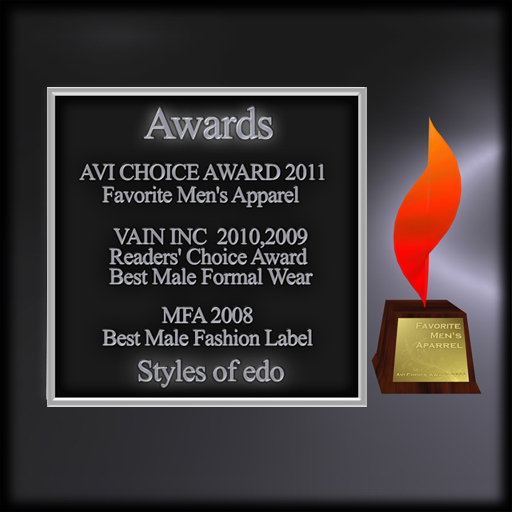 I received AVI CHOICE AWARD 2011 – Favorite Men’s Apparel this time. Thank you for your vote for me. I am very glad to get such a wonderful AWARD. The SL business, the most difficult is to keep long business in Second Life. I have run this business since 2007 and has earned BIG AWARD every year. Because I have been supported by many many people. I sincerely thank our friends and my customers from bottom of my heart. 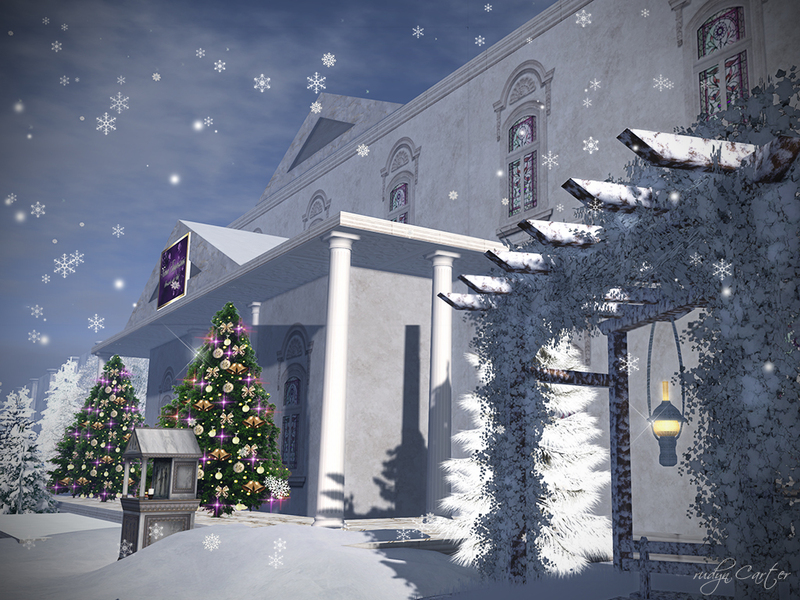 Posted in: Event, Our SIM. The Winter scenery of edo islands.